☐ always in a hurry? ☐ not getting enough sleep? ☐ neglecting your spouse or children? ☐ eating on the run? ☐ canceling or forgetting appointments? ☐ late for work or working after hours? ☐ mentally and physically exhausted? It is not always easy to manage all that is required on a daily basis. Many of us learn to manage businesses, finances, people, and so much more. 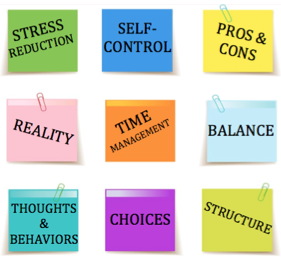 Bagwellness can help you with the priority of managing yourself. It is not always as easy as it sounds. If you can check yes to two or more of the items listed above, you could benefit from our Self-Management services. Life is not perfect and things happen that are beyond our control. Learning to manage self should not be confused with perfectionism. Sometimes you may miss deadlines, eat on the run, do not get enough sleep, and so on. It does not mean you are imperfect. If you have checked more than half of the items on the list above, it really is a good time to consider the benefits of self-management. Imagine you are the CEO of a corporation with several departments. If everyone and everything is working as it should, good choices are made, there is structure and balance, time is managed properly, the business will achieve goals and succeed. The other option is that you are the CEO of a corporation that does make good choices. There is no structure. Everything is out of balance. There’s lots of stress. You think everything is fine, but in reality, the business is failing. Is it difficult to differentiate between what you think is happening, what others perceive is happening and what is actually happening? Is it difficult to choose the appropriate thing to say, the right words to say or the best time to take action? Do you have regrets or suffer consequences because you did not understand the risks or rewards? Do you lack boundaries, feel disorganized, and think you are moving in too many directions? Do you lack discipline, are easily influenced, lose your temper, or feel like your emotions or life is out of control? Do you have frightening, confusing, racing or negative thoughts and self-sabotaging, inappropriate and harmful behaviors that need to be changed and improved? If you answered yes to one or more of the questions above, Bagwellness can help you begin a Self-Management plan that will lead to self-improvement.